Born in Florida and raised in New Mexico, Matthew Sturm somehow became an expert on snow. During the past 30 years, he has traveled thousands of miles on the substance, counted how many grains it takes to cover a football field to a depth of two feet (1 trillion), and has spent so much time lying on his side and squinting through a hand lens that he swears he has seen molecules of water moving through the snowpack. Now, he has written and illustrated a children's book on snow. 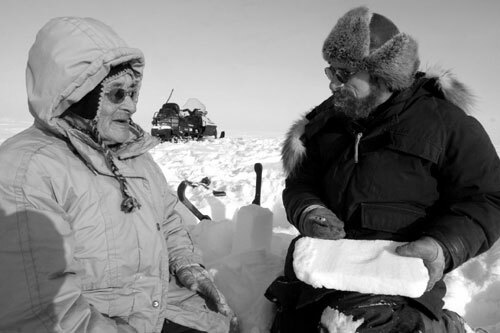 Snow scientist Matthew Sturm, right, speaks with Arnold Brower Sr. outside Barrow. 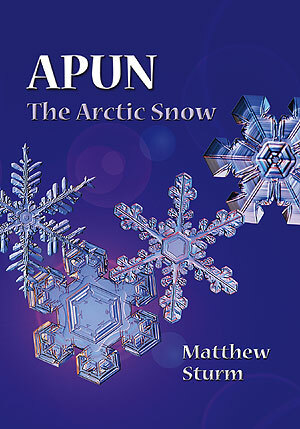 "Apun: The Arctic Snow" and its accompanying teacher's guide are Sturm's attempt to "bring snow to the kids." He works at the U.S. Army Cold Regions Research and Engineering Laboratory on Fort Wainwright. A few years ago, he rode a snowmachine from Fairbanks to Hudson Bay, studying snow along the way. While working with editors at the University of Alaska Press for a book of essays about that journey, he proposed an idea that had long tugged at his heart - a book for kids about snow, with a nod to the Inupiaq culture of northern Alaska. Image courtesy of University of Alaska Press. 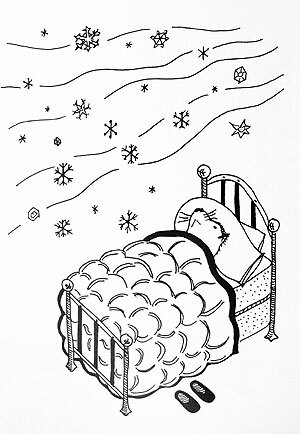 One of Matthew Sturm's illustrations for "Apun," this one showing the insulating value of snow. "I had written so many scientific papers that got read by just a handful of experts," Sturm said. "A kid's book is going to have as much of an impact as any scholarly paper I'll write." Text on the book's back cover suggests that Sturm wrote "Apun" (an Inupiaq word for the arctic snow cover) for third graders on up, but the book is a good use of time for anyone who wants to learn more about the amazing, ever-changing ground cover that's so much a part of northern life. Alaska; (Summer) is the unusual season." Sturm makes snow's complexities interesting. In the teacher's guide for "Apun," he describes the process of sintering, during which snow - unlike sand or any other substance somewhat like snow - magically sets up from powder to concrete slab after being disturbed. "Many of the parts in a cell phone are produced through sintering," he writes. "Pulverized metal is packed into a mold, heated, but not hot enough to melt it, then allowed to cool. When removed from the mold, the metal will have bonded into a single mass. Snow does the same thing ... Immediately after the winds stops blowing, the drifted snow is soft and easy to shovel, soft enough for a boot to sink into it several inches. But twenty-four hours later, after the sintering is complete, the same snow will be so hard that it is impossible to make a mark on the snow with a boot heel." Sturm's book began with his own pen-and-ink sketches of weasels, snowmachines, and snow crystals. "I grew up drawing, and had to drop it as I became a professional scientist," he said. "I joke that I wrote a kid's book so I could be an illustrator." He also calls himself an "amateur linguist," who spent many hours with Barrow elders walking outside and teasing out the complete meanings for their 70 terms for snow. "We (Sturm and Barrow elders, including Arnold Brower Sr.) added five or six words to the list of terms for snow," Sturm said. He includes an Inupiaq glossary at the end of the book that informs the reader that "masallak" is best for making snowballs. Sturm hopes his book and its teacher's guide find their way into classrooms throughout this land of winter. "Snow's all around the classrooms of kids in Alaska, Canada and much of the U.S.," Sturm said. "I'd like to think teachers wherever there is snow would find the book useful, and help them use snow right outside their classrooms to make their teaching better and more interesting."